Sergey and Yulia recovered enough from whatever harmed them to be released from hospitalization – clearly not a Novichok military-grade nerve agent as falsely claimed – able to cause death in minutes. Their whereabouts is unknown. They’re denied contact with Russia’s embassy. Nor are they permitted free movement or contact with relatives back home. They’re virtual UK hostages, Washington surely complicit in what’s been going on since the March 4 incident occurred – the Kremlin falsely blamed for what it had nothing to do with. No evidence suggests otherwise. According to former UK ambassador, human rights activist Craig Murray, Yulia’s comment about “not wish(ing) to avail myself of (Russian embassy) services” mistranslated what she said. Clearly she recited UK-scripted remarks, Reuters complicit in the deception. Yulia is a Russian national, visiting Britain only to see her father. Except for a brief April 5 scripted-sounding phone conversation with her cousin Viktoria back home, on a temporary phone given her, not her own cell phone, she’s not permitted to have, she and her father Sergey have been held incommunicado – currently at an unknown location, denied phone and computer contact with their relatives in Russia. 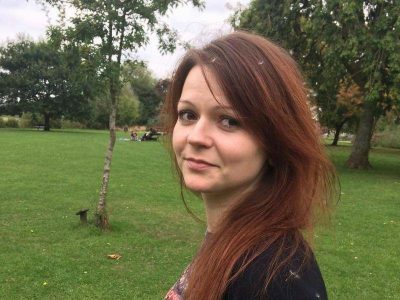 Sergey and Yulia Skripal are unwitting pawns in a dirty US/UK geopolitical plot to demonize Russia. They’re virtual UK hostages, Britain likely together with Washington responsible for their illness and captivity – harmed and held virtual prisoners, pawns in a US/UK propaganda war on Russia. They only know what they were told. They’ll likely never be permitted to speak openly or travel outside Britain freely. Nor will they be allowed to return to Russia if they wish. They’re virtual prisoners of a hostile power, fully responsible for what happened to them.